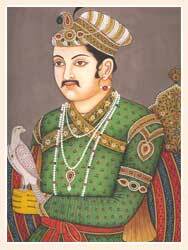 Akbar, also known as ‘Akbar the Great’, was the son of Nasiruddin Humayun and the grandson of Babur, the founder of Mughal Dynasty. He was named as Jalaluddin Muhammad Akbar and was the Mughal Emperor from 1556 to 1605 and fought several battles during his reign. He was only 14 when he became the Emperor after his father’s death. Akbar was an architect, artisan, artist, armourer, blacksmith, carpenter, construction worker, emperor, animal trainer and theologian and made several lasting contributions to Mughal architecture. He initiated a large collection of literature, including the Akbar-nama and the Ain-i-Akbari. He founded his own religious cult, the Din-i-Ilahi or the "Divine Faith".